Michael Jordan’s record-setting 63 points in Game 2 of the Chicago Bulls’ first round series against the Boston Celtics in 1986 is, on the surface, one of the most fun games in the Jordan Challenge. You get to score a lot of points, which is much easier to accomplish when you attempt a lot of dunks. That approach also greatly increases your chances of fulfilling the requirement of shooting 50% or better from the field. You don’t even have to win the game, so there’s no worrying about the score (or arguably, defense). However, you also need to rack up six or more assists, and with the Jordan Challenge’s eight minute quarters, there’s very little margin for error. I decide to fulfil the assists requirement first, and not worry about winning the game. I manage to dish out six dimes by the end of the first quarter, but I also waste some opportunities with an unassisted three by Kyle Macy, and a few misses by MJ. With only two first quarter points, I have a long way to go and only 24 minutes to score 61 points. I start feeding MJ the ball in the second quarter, and he has 19 by the half. 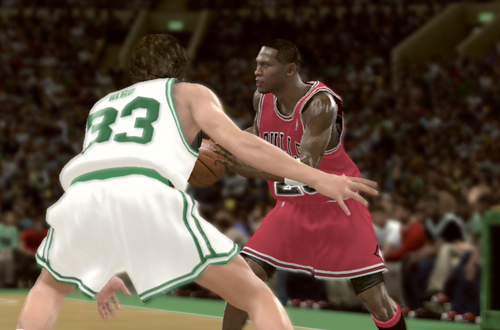 The CPU isn’t exactly playing fair, as Danny Ainge and Larry Bird both are somehow keeping pace with young MJ. I decide to save the game at the half, so that I can retry the challenge from this point if I need to. Hey, I’ll play fair when the AI does! The third quarter is much kinder, as I start getting some calls and free throw attempts, and MJ’s point total starts to creep up. He has 42 by the end of the third, so I decide to quit and save the game again, as that’s a decent total to begin any subsequent attempts with. As it turns out, however, I don’t need any more attempts. The points come quick and fast, from an assortment of dunks, acrobatic layups, and old-fashioned three-point plays. MJ gets his 63 points with two minutes remaining, finishing with 69 on 28-for-44 shooting, with seven assists, eight rebounds, and two steals for good measure. Larry Bird finishes with 43 points of his own, shooting 17-for-32. I have an ulterior motive in seeing just how many points above 63 I could score with Michael Jordan, since his 69 point game is also one of the challenges I’ve yet to compete. It also includes a “six or more assists” goal, so I expect that I’ll have to adopt similar tactics to clear that challenge. Hopefully, it’ll be a little easier against the 1990 Cleveland Cavaliers, especially as that Jordan’s ratings are a little higher, and his teammates are significantly better. Still, it’s probably going to be another case of keeping a save game where I’m close to achieving all the goals, so that I don’t have to start over from the beginning if I ultimately fall just short. 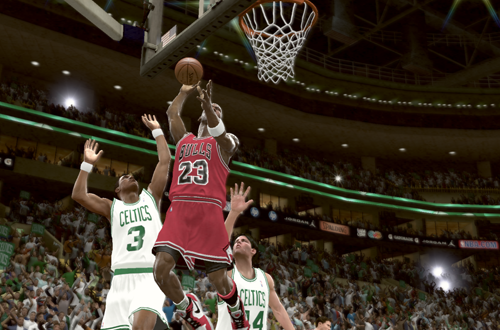 This is one of my all-time favourite Michael Jordan games. I remember watching it anxiously back in 1997, and being ecstatic when the Bulls pulled out the win behind MJ’s legendary performance. As far as the Jordan Challenge is concerned, it’s arguably one of the easier ones. Despite the fact that MJ is flagged as injured in the game to drop his ratings down a bit, he’s still a 92 Overall, and more than capable of putting up at least 38 points and dishing out five or more assists. That was obviously a strong Bulls team, so picking up the win is also quite feasible. The most challenging part will be grabbing the seven or more rebounds. I decide that once again, I’ll focus on getting the assists in the first quarter, along with a couple of buckets and – if I can manage it – some of the rebounds. 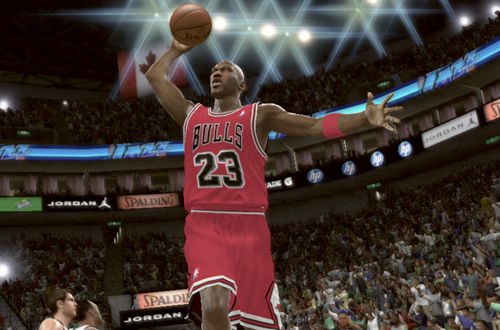 I get the five dimes without too much trouble, and with MJ adding a few points of his own, I’m in control of the game. I can already tell that the rebounds will indeed be the toughest part of the challenge, though I do manage to snag four with MJ by halftime, to go along with 19 points and seven assists. I can see myself coming up short on the boards, so once again I save the game at the half, to give myself a decent head start on the challenge if I need to take another run at it. MJ scores at will in the third, blowing by Jeff Hornacek for several dunks, knocking down a three, and stroking the midrange jumper. I hit 38 points by the end of the period, but I’ve only managed to add one more rebound. Some golden opportunities literally slip through my fingers, thanks in no small part to Dennis Rodman and Scottie Pippen cleaning the glass. I save the game at the beginning of the fourth and aggressively chase down boards with MJ, which allows Hornacek to get a couple of easy ones. It also allows me to grab the last two rebounds with plenty of time left, however, and complete the challenge with 48 points, seven rebounds, and 13 assists. Seven down, three to go. 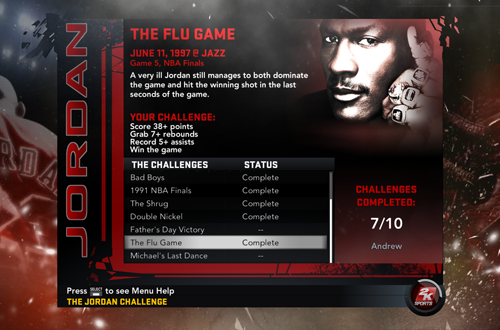 The remaining challenges are 69 Points, Father’s Day Victory, and Michael’s Last Dance. I expect all three to be fun games, but each of them has one particular statistical requirement that makes things just a little more difficult. Nevertheless, as soon as I’m ready to take a short break from NBA 2K17, I’ll be giving them a try. Stay tuned for Part 3 of Finishing The Jordan Challenge!